As a first-time mom, I was very uncomfortable with the thought of leaving my daughter in the care of someone other than a family member whether we were home or away. But once my son came along, I understood the need. BIG TIME. First-time parents don’t necessarily need a resort with a lot of bells and whistles (yet). But those who have two and maybe even three little ones? THEY. NEED. A. BABY. CLUB. Most resorts offer some form of private babysitting, or can refer you to a local agency who can help out. But having the convenience of a place to drop off little ones, even just to get them into some air-conditioning for a little bit, can mean a real vacation for you and your partner too. Cuba still struggles sometimes with the perception of less-then-appetizing food or somewhat haphazard amenities. But, Cuba is awesome for families. It is safe and clean. And, while the number of resorts that can accommodate large families is somewhat astounding (ie – very very few) it actually has quite a lot of resorts with baby clubs. Listed below are the resorts with baby clubs in Cuba. Click here for a more in-depth look at these resorts and what they offer. Punta Cana seems to be the place to be, as all the resorts with baby clubs in the Dominican Republic seem to be located here. 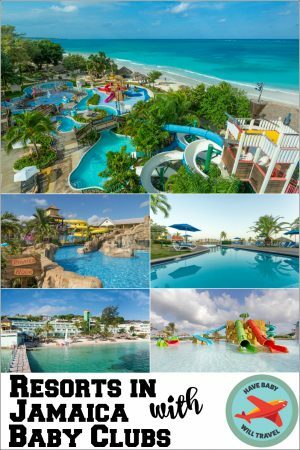 While the mega-resorts can seem huge and a little overwhelming, knowing there’s a well-regarded baby club on site that will happily take your baby or toddler for a little while might give you a chance to explore some of it. 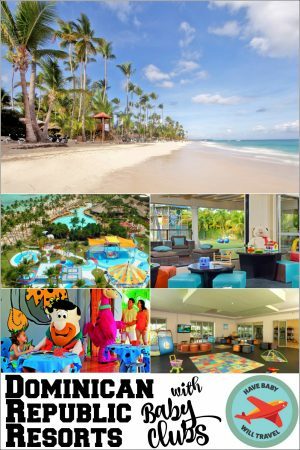 Listed below are the resorts with baby clubs in Dominican Republic. Click here for a more in-depth look at these resorts and what they offer. Jamaica kind of takes the cake when it comes to availability of baby clubs. They’ve got the creme de la creme with two Beaches Resorts plus the wonderfullness that is Franklyn D. Resort and their famed vacation nannies. Jamaica may be pricier than some other Caribbean destinations, but if you factor in the things like potable tap water, good medical care, and great food, and maybe padding the budget a bit is worth it. Listed below are the resorts with baby clubs in Jamaica. Click here for a more in-depth look at these resorts and what they offer. Mexico and its warm and wonderful family-friendly culture has many destinations with their own appeal, plus so many different accommodation options that are suitable for families. They have some amazing resorts, and some of those resorts offer included baby care (or in the instance of Club Med Ixtapa Pacific, available at an extra cost). Given Mexico‘s size, there are actually not that many resorts with baby clubs, and with the exception of Club Med’s Baby Club Med and Melia Puerto Vallarta, the minimum age to participate starts at one year. Listed below are the resorts with baby clubs in Mexico. Click here for a more in-depth look at these resorts and what they offer. The incredible baby club is included and available for babies as young as 4mos. This resort is truly the jewel in Beaches Resorts‘ crown and, sadly, it is closing! Check out the statement below and if you can squeeze in a visit within the next year or two outside of their temporarily closed times, I highly recommend you do! Beaches Turks & Caicos Resort Villages & Spa will be closed from September 3rd to October 15th in 2019 and from September 7th to October 22, 2020, and then for an indefinite period from January 2021. Guests traveling between now and January 2021 that are not impacted by these closures will receive the vacation experience that we have become known for. All features and facilities of the resort will be open and operating per usual. For impacted guests, we are committed to making this as seamless as possible by allowing them to change their travel dates to Beaches Turks & Caicos or travel on their original travel dates to one of our other locations in Jamaica, Beaches Negril or Beaches Ocho Rios, at no additional cost, including airfare change fees.